i won that nails inc set on ebay and it got delivered today. it cost me about £40, considering they’re £11 each i think that’s quite a bargain for 10! top row: eccleston mews, orchard street, walton street, saville row and glasgow. bottom row: duke of york square, draycott place, pimilco road, holbien road and princes street. 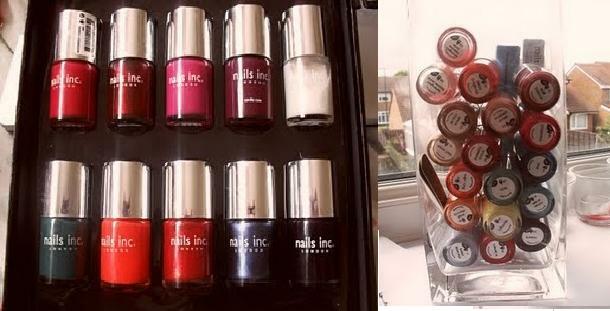 the second picture is how i store my nails inc polishes, it’s just a cheap vase and they stack in quite nicely. only problem is that if you want a colour from the bottom you have to tip them all out.